Tuesday evening we got to head over for NVG assisted night driving in the Hummers. Very cool evolution! 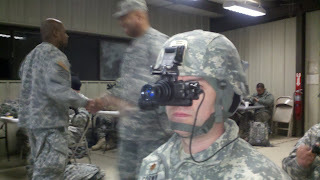 It started with a quick familiarization with the actual NVG's. Here you see how cool our colorectal surgeon looks in NVG's. Next, we got into the vehicles and drove a course through the snow and woods. First time around was with headlights to familiarize us with the course. Then it was go time! All lights out including the classroom building and NVG's on! SO cool how well you can see and really fun to blast through the snow and ice with all that cool gear to help you. Christian took this through the NVG's. Wednesday evening it started to snow. Hard. Now, when I was a kid, and even through medical school, I used to love it when a big storm came in in the evening. The thought of a "snow day" was almost as good as Christmas! An unscheduled break from study meant snowmen, snowball fights, hot chocolate, and... well, NO SCHOOL! Those were the days... But alas, here at Fort Dix, a snow day means you have to make up the training another time. That could be as simple as an extra long day later on but it could also mean that training gets extended. More time at Fort Dix means... more time at Fort Dix. Now don't get me wrong. Things are going very well in our class and there are clearly worse places to be. That said, I think we are all anxious to move ahead and get "down range" as they say. (Down range, in our case, means Afghanistan) See, while driving HMWVV's and shooting guns is kinda fun, we all want to get where we're going so we can do what we do best... take care of patients. To that end, we need to get this training thing out of the way quickly so we can get to the substance of the deployment. So anyway, back to Wednesday. It starts to snow as we return in our HMWVV's from martial arts training where, after doing 100 four count jumping jacks plus numerous other PT exercises for an hour, we learned multiple ways to choke someone out. Awesome! At this point we (or at least I) start to worry that we might lose a day of training. We wake up to an absolutely blanketed base and word that the entire base is shut down until 1300 (1:00 PM for you non military types...). Thankfully we didn't have any training scheduled until then but there was still a chance that the "base closure", if you will, would get extended and we'd lose the day. "Stand by until we get the latest word to you at 1100". So we stood by. While standing by, Dr. Corwin and I decided to take a recon of the base and hopefully get a cup of coffee from Dunkin Donuts. I'm not really sure why we thought there would be any chance whatsoever that Dunkin would be open when the rest of the base was closed. I guess in my mind I could picture the "Time to make the donuts" guy traipsing in at 4 am to... well, to make the donuts! Whatever the reason, we went ahead and secured the keys to the van and postholed through the snow with a broom and shovel to dig it out. The roads were snowy but passable and we headed toward our objective. 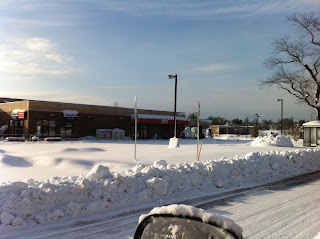 could see that the mini mart adjacent to DD had a completely unplowed parking lot and a guy with a snowblower had just started clearing a path to the door of the donut shop. He angrily waved us away as we sat there staring like kids with no money watching the ice cream truck drive away. The coffee run was a failure. So we drove around a little taking pictures of snow covered tanks and then headed back to the barracks where we managed to get the van stuck while parking. But hey! We killed 45 minutes! Great success! Ultimately, the instructors came to our barracks for our M4/M16/M9 PMI class so we didn't lose the day! Score one for the good guys! Friday was a day off so we all managed to find our way to the gym, go for a run, hit the exchange and commissary, etc. Sounds great right? Not really. If you aren't sure why I say that read paragraph number two above. Remember, we aren't allowed off base. We can't drink. We can't wear civilian clothes. So a day off ends up being kinda boring. The DFAC (chow hall) food was starting to wear on me so my visit to the commissary included picking up a little snack for us all. If you know me, you know I love cheese! All they serve in the DFAC is American. 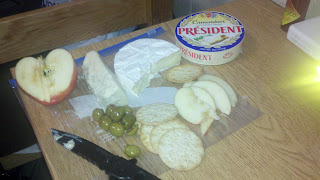 So I picked up a little Camembert and some Gorgonzola Dolce! Add some honey crisp apple slices and marinated olives and voile'! Dix life is almost bearable! So here we are on Saturday evening. The range time was great and everyone qualified! One more box checked. One day closer to validation. The best story from the range involves our OIC, Captain John Raheb and our plastic surgeon, Ken Ortiz. The first portion of the range time was basically a familiarization fire of our weapons at paper targets. You had to shoot ten rounds each from standing, crouching, kneeling and prone. A score of 24 or better and you could move onto the actual qualification. Too easy, right? Well, CAPT Raheb and CDR Ortiz were shooting in adjacent lanes. After cease fire was called, the instructor went out to score the targets. Captain hit 25 out of 40... passing, but just barely. Interestingly, CDR Ortiz somehow managed to hit 50 out of forty... Hmmm that doesn't make much sense... oh wait... it does if someone else was shooting your target!!! You kinda had to be there but trust me, we all had a good laugh about it. Below you can see the miracle target in question and the "team" that made it happen. So you're all up to date now! Class 011811BMED continues the march toward points beyond! See ya next time! Ryan and I enjoyed the latest adventures. I do think he'd like to join you and bring his toy soldiers that he says look just like you. We're very proud of your work and effort. Miss you a ton. Missed ya this weekend! Sounds like you've been driving some pretty cool rides! Although I do believe I would keep the mouse in the house once I saw the frozen port-o-let water!!!! It got down to 49 today and I had four layers... And don't worry, we'll drink your share... And watch out for that surgeon who can't even shoot his own target!!! So glad I can read up on what you are doing! We have been hammered with snow here too. The kids had snow days the last 2 days and it is flippin' cold! A high of 9 degrees today! I'm glad you are doing well!